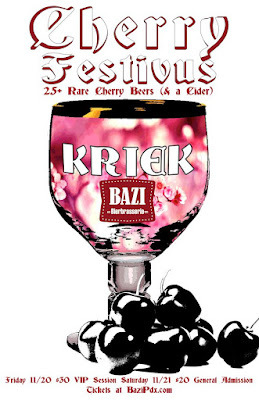 Introducing Portland's new Cherry Festivus this November 20-21,2015. What simpler pleasure than nature's finest Cherry? Tart, sweet, distinctly it's own flavor, the Cherry goes well with sweet or savory as well as Beer and Cider. The Cherry may be the world's most popular fruit and there is a world of beers to showcase them. So the creators of uber-popular events like the Portland Fruit Beer Festival and the Peche Fest are pleased to announce the first annual Cherry Festivus, a showcase of 25+ beers featuring Cherries and a cider.